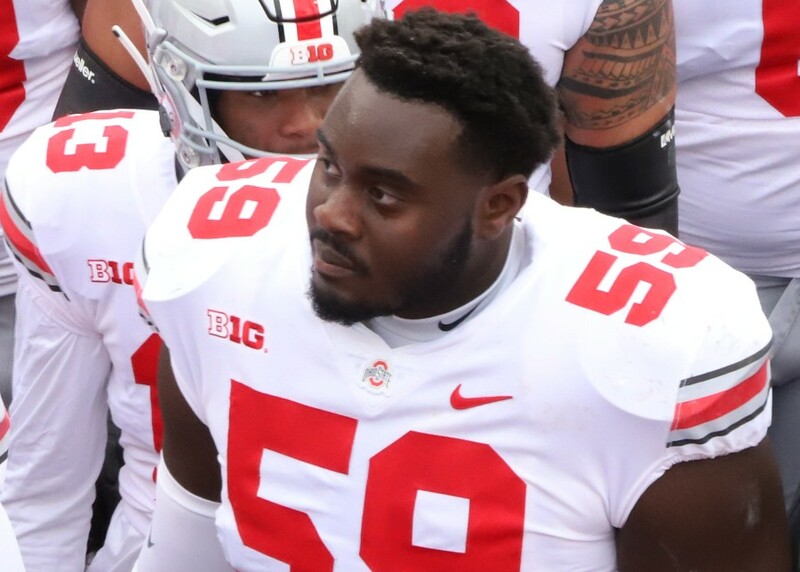 After having to replace a two-year starter at left tackle in Jamarco Jones prior to last season, the Buckeyes are now in the situation of having to replace a three-year starter in right tackle Isaiah Prince. As a sophomore, Thayer Munford stepped in for Jones admirably and played well last year. The hope is that somebody will be able to do the same in place of Prince this year. Prince was a captain and a First-Team All-Big Ten selection last season. In 2017 as a junior, he was named Third-Team All-B1G. Replacing him won’t just be about filling his right tackle position, but also providing leadership through action and words. Projecting an offensive line can get tricky because coaches are usually looking for the best five, and then they’ll move them around as need be. We saw that last year with Michael Jordan moving to center. As such, it can also be difficult to accurately assess the candidates to replace Isaiah Prince, but there are four key names to keep an eye on. The first two are the two backups at tackle last season. Nicholas Petit-Frere was Prince’s understudy last season as a true freshman and the staff would love to see him take the spot. The other is fifth-year senior Joshua Alabi, who was Thayer Munford’s backup last year at left tackle. Alabi began his Buckeye career as a defensive tackle, but has been on the offensive line for a few years now. Petit-Frere, meanwhile, is the highest-ranked offensive line recruit for the Buckeyes since possibly Orlando Pace. Redshirt freshman Max Wray will also bear watching, as may true freshman Ryan Jacoby. 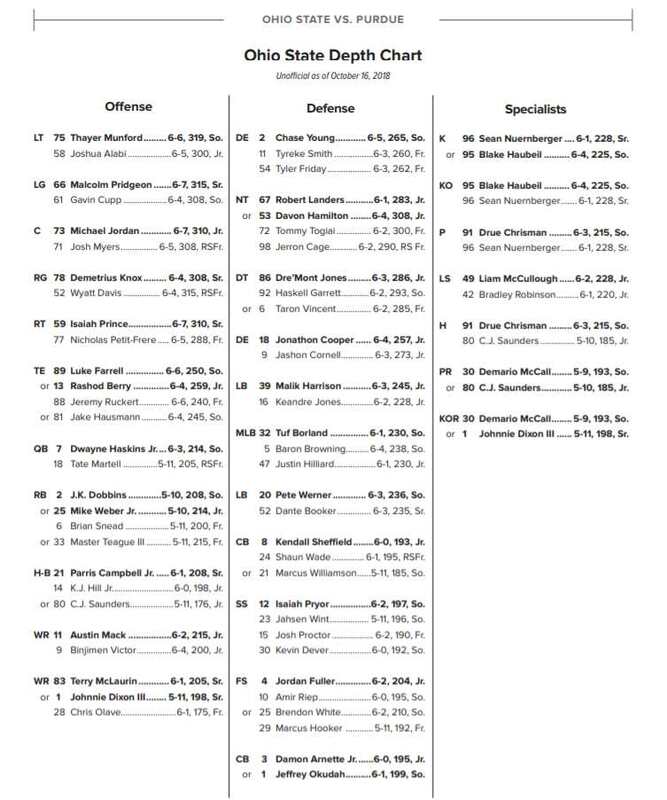 Jacoby has been a left tackle since junior high, so seeing him ascend to the top of this depth chart would be a surprise in more ways than one. Fifth-year senior Branden Bowen can probably play any of four different spots on the offensive line, but it seems logical that he will end up at one of the two open spots at guard. If the guards end up being deeper than the tackles, however, we could see Bowen here when the depth chart solidifies. Offensive line coach Greg Studrawa returns, so he already has a very good idea of what he has to work with this spring. Nicholas Petit-Frere and Joshua Alabi will likely be the two guys who get the most reps. Studrawa will want to give both guys enough work for one guy to step forward or one guy to step backward. Plus, the competition should get the best out of both of them. Max Wray will likely also get some reps as Studrawa looks to find his top five. Joshua Alabi is the most-experienced candidate for the job and has played well in his opportunities when teammates have gone down with injuries. The potential of Nicholas Petit-Frere, however, is impossible to ignore. He also practiced all last season at right tackle, which may even out the experience factor. Obviously, if somebody outright wins the job, then Studrawa will take it. If it’s dead even, however, they may then go with youth and potential, which would also then give them a returning starter in 2020. Ideally, Petit-Frere will win the job because the staff is hoping his potential will now match his play, which will only improve from here on out. For that reason, he’s the best bet right now to replace Isaiah Prince. I joined this party late but I would echo what others have said regarding Mr. First Team in penalties committed! I’m sure that any of the back up players are capable of committing as many penalties! A lot of negative posts here and I can only defend the kid so far – he improved a LOT over his career and while he won’t make anyone forget Jack Mewhort, much less Orlando Pace, it could have been a LOT worse and a lot of teams would have loved to have had him. All that said, there are a couple kids I’m intrigued with and should be interesting to see if they’ll step it up or down from Isaiah. I still don’t understand how he was awarded 1st Team All-B1G. I don’t like to bad mouth these young men, so I’ll leave it at that. My pet monkey, our offsides penalties would decrease by 50 per cent. I think he had so many cause he could not count past two haha. Isaiah had some good games, but they were sprinkled in with a bunch of not so good games. The man is a mountain but I had cold shivers when there had been talk about moving him to the blind side. Haskins very well may have been bound permanently to a wheelchair. Could anyone imagine him in Jim Tressel’s offense? Having to hold his water for an entire play clock would have been painful and also humorous at the same time. It won’t be tough finding a new body to at least mirror him. Heck, it could even get better…………..by a lot.